About a month ago I was in a mood. I was frustrated. I was sick and tired of all the go, do, and hustle messages that I was bumping into around the internet. Can I just tell you that never in my life have I achieved any amazing life change in any of those time frames. My entire life I have been a plodder. I have reached some BIG goals, but I have done it SLOWLY. I ran a marathon, but it took me 3 years to build up to running that long. I have built a blog that earns me a good part time income, but it took me 3 years to do that. I hate to even mention how long it took me to complete a 4 year bachelor of arts degree (if you really want to know, it was 10 years! In my defense, I did take some time off before completing the final semester thanks to a honeymoon baby we were not planning on). During my, “I am so sick and tired of people preaching FAST FAST FAST!” mood, these words penned in the image above came to me. 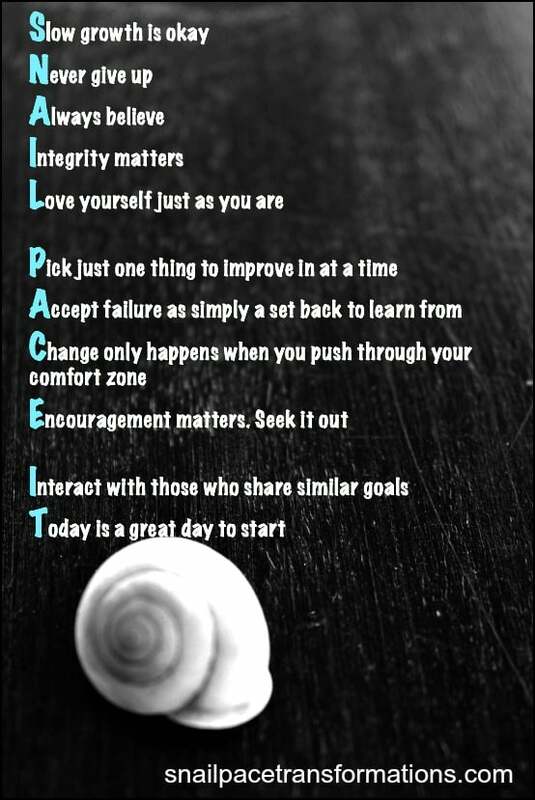 It is an acronym for SNAIL PACE IT. The funny thing is I have never been a fan of acronyms. I always mess them up or forget what they are even called. Honestly, I had to enter, “What is it called when you take a word and break it down to make each letter stand for something,” into Google to find out that acronym was the correct term! But I digress! I want this acronym to be encouraging to those of you who like me prefer taking things one small step at a time, not share with you my lack of English term knowledge. Fast doesn’t matter. Finishing does. No, actually that is partially wrong–there is something that matters even more than the finishing–the journey. How you get to your goal matters. Your journey speaks volumes about your priorities. Your finish line photo speaks only about your discipline. I took 3 years to get to my marathon goal because I was squeezing in my runs in the morning hours so that I didn’t use precious family time for running. I took 3 years to build this blog to the point that it makes a good solid part time income because I blog in the in between moments. In between homeschooling, in between soccer games, in between gymnastics, in between child and mom conversations. I took 10 years to finish my degree because I took time off. Time off to enjoy my children in their infancy. Time to make sure I didn’t rush the moments. Time to make sure I savored each one. My journey speaks volumes to my priority–family. I am a focused individual–I get very caught up in whatever I am doing. I had to snail pace my goals so I didn’t miss my dream. My dream of mothering well. My dream of a deep and meaningful marriage. My dream of a whole family. What is the journey on the way to your goals speaking? Don’t rush the journey. The finish line isn’t going any where. I love it! Too many people give up because they stopped, but it is the long term process and end goal that matter, so any day is a good day to start, or start again. Yes what we do over the long term is often much more important than what we do in the short term. Goals met slowly are more likely to stick and become life changes than those achieved fast. I once heard that over 50% of Biggest Loser contestants gain their weight back and more within a few short years of being on the show. That to me speaks to the fact that fast changes often don’t stick. I l.o.v.e. this! To me, you are an even bigger inspiration than those people who can achieve a goal in a short time, because you didn’t give up. It makes me feel good to know that after a long time of repeated small steps, you really did get to those bigger goals. I always, always feel like I’m so far behind the crowd on everything. But if I keep going, some day I will catch up. This is such a great read. I’m especially feeling the pressure to do things fast when I keep all those blog post titles about paying off large sums of debt in short periods of time. Meanwhile, I’m struggling to figure out how it’s possible for these superheroes to get it done. However, I must learn to love the person I am at this stage as I reach for my goal. It’s time I just enjoy the journey instead of getting frustrated that it hasn’t ended yet. Yes, it is tough. I wouldn’t have wrote this post if I didn’t struggle with it myself, but as I look back there isn’t a single goal I have completed where I am like “man I wish I had completed that sooner” there is just something about the journey. Your words are a great encouragement! Right now, my blogging gets squeezed into the in between times of being a wife and mom which means my blog is slow growing. I’ve felt like quitting a few times, but I know that God wants to use it. I love that you said our journey speaks about our priorities. Often it is easy to compare our journeys to other people’s, but we forget that their priorities may be different from ours. Keep at it! Slow growth adds up over time in the blogging world.